Blog - Cultural Landscape Legacies, Inc.
Winter has not yet relinquished the icy grip on the landscape but the calendar says spring will arrive soon. The tradition of observing solstice and equinox events at a site in southern Richland County will continue with marking the vernal equinox amongst the ancient effigy mounds at Frank’s Hill near Muscoda. The Three Eagles Foundation will welcome people for the sunrises and sunsets on Wednesday and Thursday, March 20th and 21st, in recognition of the changing of the seasons. Spring officially begins at 4:58 p.m. (CDT) on Wednesday, March 20th, meaning the first sunset of spring will be that evening and the first sunrise of spring will be Thursday morning. Representatives of the Three Eagles Foundation will be on Hill East on Wednesday evening for the sunset. Frank’s Hill will be open to the public for self-guided tours on all other days. The sunrise/sunset observations are subject to suitable weather conditions. A short hike will be required to the top of the hill that offers a stunning view of the lower Wisconsin River valley. Guests should arrive by 6:15 a.m. for sunrise or 6:15 p.m. or earlier to observe the sunset. The site is located 2 miles west of Muscoda near the intersection of Hwy. 60 and Hwy. 193. Park well off the road on the shoulder and enter by the gate. Frank’s Hill is on the National Register of Historic Places. 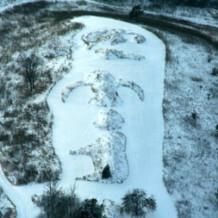 A group of unique effigy mounds is situated on Hill East where the observances will occur. The mounds are thought to have been built a thousand or more years ago by the people of the Late Woodland Tradition, recognized by many as the ancestors of the modern Ho-Chunk Nation. To learn more about the equinox event or for directions, contact Three Eagles Foundation President Dave Martin at (608) 739-4198 or Vice-President Mark Cupp at 739-2179 or visit the Foundation’s website or Facebook page. The public is invited to Frank’s Hill in southern Richland County on Friday, December 21st, when the setting sun on the shortest of day of the year will be viewed from a small knoll peppered with effigy mounds in southern Richland County. The property is located on STH 193 just off STH 60 a few miles west of Muscoda and has been the site of many solstice and equinox gatherings in the past. Weather permitting, area residents are invited to join the festivities and remember events of the past year. A moment of silence will be observed for those who have passed away since the last trip around the sun. Following the sunset, attendees are welcome to gather around the campfire to share stories and learn more Frank’s Hill. The event is sponsored by the Three Eagles Foundation. Frank’s Hill is on the National Register of Historic Places. 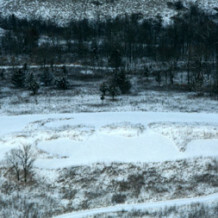 A group of unique effigy mounds is situated on the East Ridge where the event will occur, which looks across to the west ridge where a line of small mounds, believed to be calendar mounds, is situated. The site offers a panoramic vista of the area which once contained the highest concentration of bird effigy mounds found anywhere in the world, including the remnants of the giant Ghost Eagle mound with a wingspan of over ¼ mile. The Ghost Eagle mound factors into the alignment with the setting sun on the winter solstice. Most archeologists agree the mounds were built a thousand or more years ago. Participants should arrive by 4:00 p.m. to allow for time to hike to the top of the hill. Dress warmly and bring food, drink and a chair for sitting around the fire. Directions to Frank’s Hill are as follows; from the north end of the Muscoda bridge at the intersection of STH 80 & 60, drive west on Hwy. 60 for two miles and turn north on STH 193. Park by the first gate on the east side of the road, a short distance from Hwy. 60, and walk to the top of the hill. To learn more about the solstice event or for directions, contact Dave Martin at (608) 739-4198 or Mark Cupp at (608) 739-3188. Additional information may be found at the Three Eagles Foundation website or Facebook page. 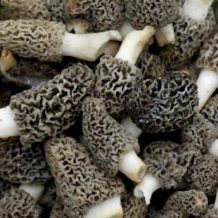 The Lower Wisconsin State Riverway Board and two archeological organizations are cooperating to add a touch of the past to the 2018 Muscoda Morel Mushroom Festival on Saturday, May 19th and Sunday, May 20th. The Three Eagles Foundation will offer guided tours of Frank’s Hill, an effigy mound site near Muscoda, and Cultural Landscape Legacies member Dr. William Gartner will give a lecture on Native American agriculture from 1000 years ago. Dr. Gartner’s lecture is entitled, “Furrows Beneath the Forest, Ridges Above the Prairie: Wisconsin Indian Agriculture from 800 AD to Present”. Dr. Gartner, a UW-Madison professor, has done extensive research on Native American prehistoric agriculture sites, including a raised garden bed site near Wisconsin Dells. Currently, he is working with the Menomonee Nation on a site in northern Wisconsin. Dr. Gartner is known as one of the foremost geo-archeologist in the region. He also worked for many years with the excavation at the famous Gottschall Rock Shelter between Muscoda and Highland. Dr. Gartner’s lecture will begin at 10:00 a.m. at the Muscoda Public Library. Guided tours of effigy mounds at Frank’s Hill will be given by Mark Cupp, Riverway Board Executive Director and Vice-President of the Three Eagles Foundation. Cupp worked for many years with former landowner Frank Shadewald on protection of the sacred site in the Town of Eagle, Richland County. The tours will depart from the library at 10:30 a.m. and 1:00 p.m. on Saturday and at 10:30 a.m. on Sunday. A short hike will be required to the top of the hill. Participants will learn about the effigy mound building culture that flourished in the region over 1000 years ago and will receive information about the unique mounds at the site. Frank’s Hill also offers a tremendous panoramic vista of the lower Wisconsin River valley. Two local naturalists will lead nature hikes along the Wisconsin River and backwaters on Saturday and Sunday at 11:00 a.m. each day. The tours will depart from the Wendell and Vi Smith Shelter by the boat landing at Victora Riverside Park. The guides will be Jane Furchgott on Saturday and David Kopitzke on Sunday. On Saturday, Furchgott will focus on the birds and plants of the river and backwaters. On Sunday, Kopitzke will focus on bottomland forest habitat as well as the other plants and birds along the way. The hikes will last approximately one hour and will be on level ground. Bring a pair of binoculars and camera!!! Organizations and agencies making these events possible include the Muscoda Festival Committee, Three Eagles Foundation, Cultural Landscape Legacies and Lower Wisconsin State Riverway Board. Persons interested in additional information regarding the Muscoda Morel Mushroom Festival may visit the website at www.muscoda.com or Facebook page. For information on the effigy mounds tours and lecture, contact the Riverway Board by calling 1-800-221-3792 or (608) 739-3188 or by e-mail at mark.cupp@wisconsin.gov. For further information, contact Mark Cupp at (608) 739-3188. Bid farewell to winter and welcome spring by observing the vernal equinox amongst the ancient effigy mounds at Frank’s Hill near Muscoda. The Three Eagles Foundation will welcome people to observe the sunrises and sunsets from Saturday through Wednesday, March 17th to 21st, in recognition of the changing of the seasons. Spring officially begins at 11:15 a.m. (CDT) on Tuesday, March 20th. Representatives of the Three Eagles Foundation will be on Hill East on Sunday evening for the sunset. Frank’s Hill will be open to the public for self-guided tours on all other days. 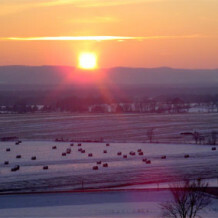 The sunrise/sunset observations are subject to suitable weather conditions. A short hike will be required to the top of the hill that offers a stunning view of the lower Wisconsin River valley. Guests should arrive by 6:15 a.m. for sunrise or 6:15 p.m. or earlier to observe the sunset. The site is located 2 miles west of Muscoda near the intersection of Hwy. 60 and Hwy. 193. Park well off the road on the shoulder and enter by the gate. The public is invited to Frank’s Hill in southern Richland County on Thursday, December 21st, when the setting sun on the shortest of day of the year will be viewed from a small knoll peppered with effigy mounds in southern Richland County. The property is located on STH 193 just off STH 60 a few miles west of Muscoda and has been the site of many solstice and equinox gatherings in the past. Weather permitting, area residents are invited to join the festivities and remember events of the past year. A moment of silence will be observed for those who have passed away since the last trip around the sun. Following the sunset, attendees are welcome to gather around the campfire to share stories and learn more Frank’s Hill. The event is sponsored by the Three Eagles Foundation. Frank’s Hill is on the National Register of Historic Places. A group of unique effigy mounds is situated on the East Ridge where the event will occur, which looks across to the west ridge where a line of small mounds, believed to be calendar mounds, is situated. The site offers a panoramic vista of the area which once contained the highest concentration of bird effigy mounds found anywhere in the world, including the remnants of the giant Ghost Eagle mound with a wingspan of over ¼ mile. The mounds were built a thousand or more years ago. Participants should arrive by 4:00 p.m. to allow for time to hike to the top of the hill. Dress warmly and bring food, drink and a chair for sitting around the fire. Directions to Frank’s Hill are as follows; from the north end of the Muscoda bridge at the intersection of STH 80 & 60, drive west on Hwy. 60 for two miles and turn north on STH 193. Park by the first gate on the east side of the road, a short distance from Hwy. 60, and walk to the top of the hill. To learn more about the solstice event or for directions, contact Dave Martin at (608) 739-4198 or Mark Cupp at (608) 739-3188.